“Hello Stephen, I offer more feedback for my QB57 which I've tuned and lubed, including making the trigger pull short, easy and crisp. 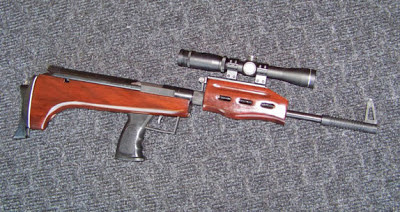 I somewhat straightened the rod connecting the front and rear sections of the trigger, which essentially lengthened it. That shortened the first stage. I then adjusted the vertically situated screw in the rear section of the trigger mechanism for a shorter second stage and applied blue Loctite (appx. 15 turns in). It's as close to a target friendly trigger as my gun is likely to get. Also, I installed an NCStar 2-7x pistol scope, which has very long eye relief (I've got it as far forward on the rail as possible), allowing me to shoot comfortably without having to crane my head forward on the stock. 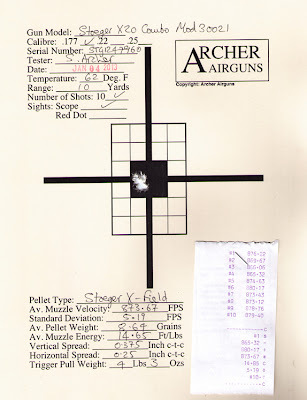 The only drag with this particular scope was adjusting the parallax (no OA) to my preferred 10 yds. It was a tedious battle of adjusting both lenses, as one did effect the other, but now that it's set, it works fine. 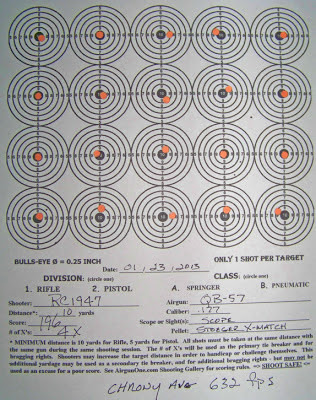 I finally broke down and bought a Shooting Chrony Alpha and did some testing of the 57 using 12, 8.2 gr., Stoeger X-Match pellets (it likes those and H&N Sport - same pellet?). The average velocity for my gun was 632 fps. 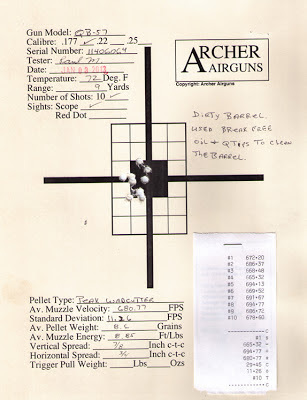 The attached target was my first shot after the trigger work. I hope to do better with further practice. 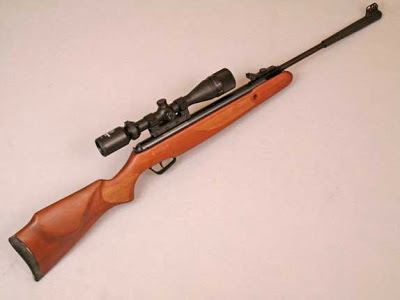 All in all, I think the QB57 a sensational airgun that is a joy to shoot. I hope to be consistently shooting 200 point targets with several X's to sweeten the deal; the gun is more than capable of doing it given the right pellet and a patient shooter. 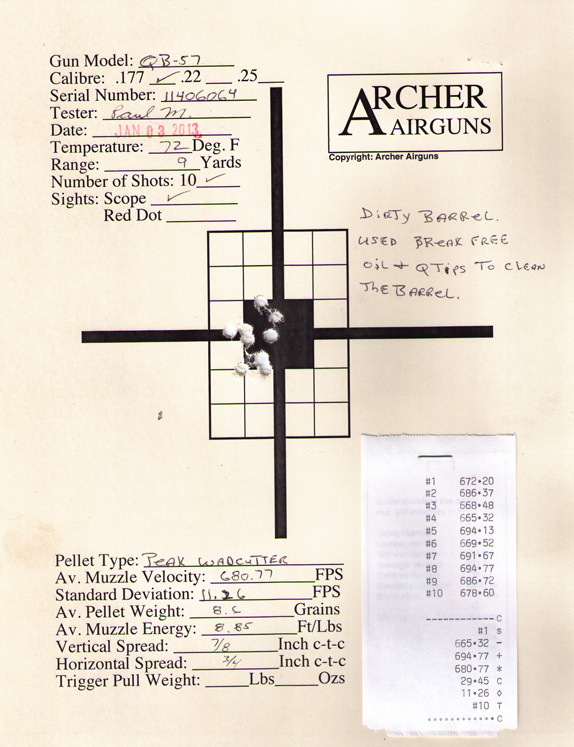 Randall, thanks for your comments - that’s great shooting from your QB57! 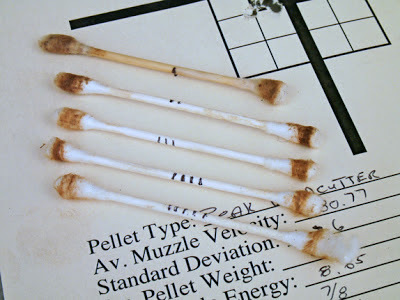 SAFETY NOTE: Always keep your arm between the cocking lever and body of the QB57 when loading pellets to avoid this happening to you. Crosman 1377 or 2240 trigger pull weight too heavy? Here's how to improve it. 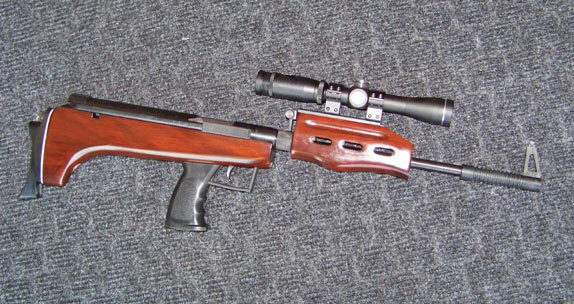 The Crosman 1377 and 2240 are excellent air pistols. But one very common complaint is that the factory trigger pull weight is much too heavy, typically well over 5 lbs. The Archer Airguns 13/22 SuperSear solves this problem simply and easily, reducing the trigger pull weight on these pistols by around 2 lbs - that's a huge 40% improvement! 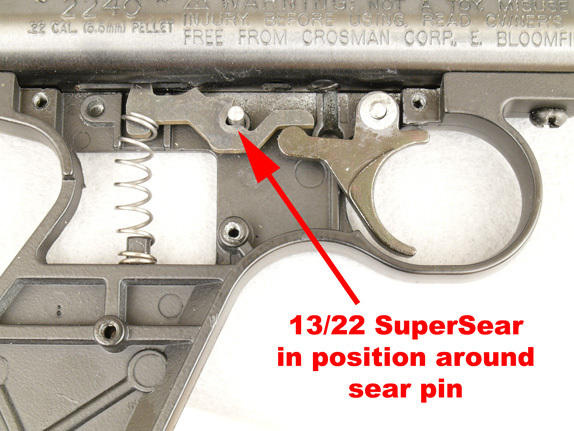 The 13/22 SuperSear is installed by simply removing the right side pistol grip, removing the factory sear and replacing it. Full instructions are included with the kit. 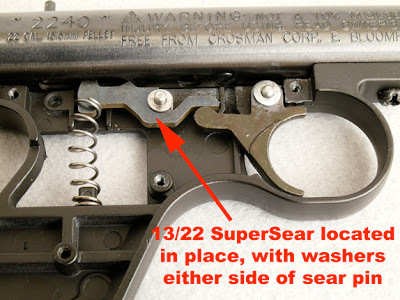 The included stainless steel washers help to center the sear and trigger, removing the objectionable side-to-side "slop" that's felt in the factory trigger assembly. 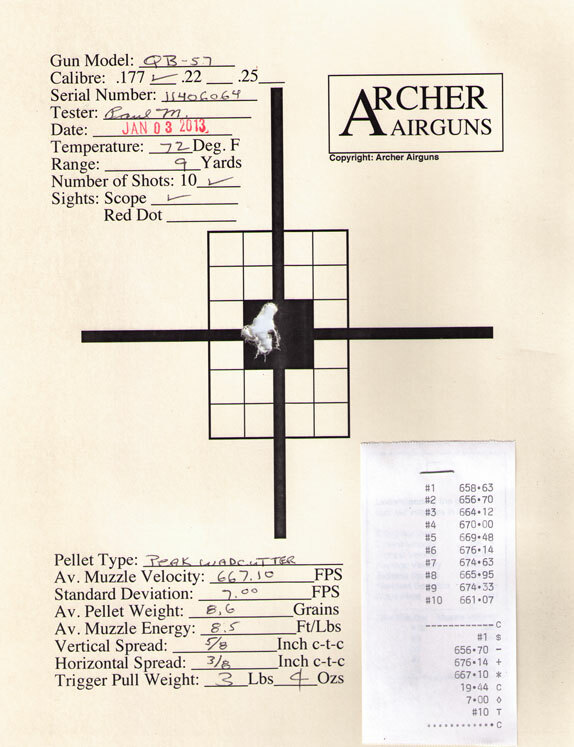 Note that the Archer Airguns 13/22 SuperSear is designed for use with UNMODIFIED Crosman 1377 and 2240-type air pistols. It may not work - or even be dangerous - if installed in combination with other trigger modifications such as weaker sear springs. If you've already made other trigger mods to your pistol, please don't add a 13/22 SuperSear! 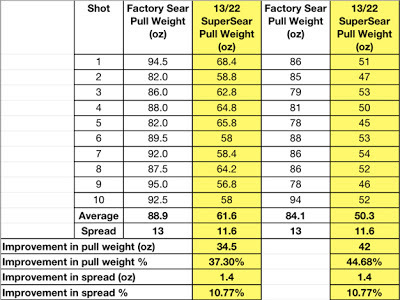 We tested the trigger pull weight of two new, unmodified, Crosman air pistols (one 1377 and one 2240) both in standard factory condition and with the 13/22 SuperSear installed. 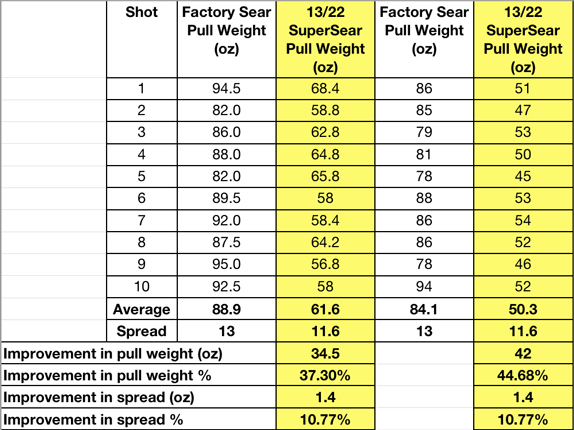 Here's some test data that shows the huge improvement in trigger pull weight provided by the 13/22 SuperSear. As you can see, the 13/22 SuperSear transformed these air pistols from having a trigger pull weight of over well over 5 lbs, down to below 4 lbs. This, together with the improved "feel" of the new sear, aids accuracy considerably when shooting. 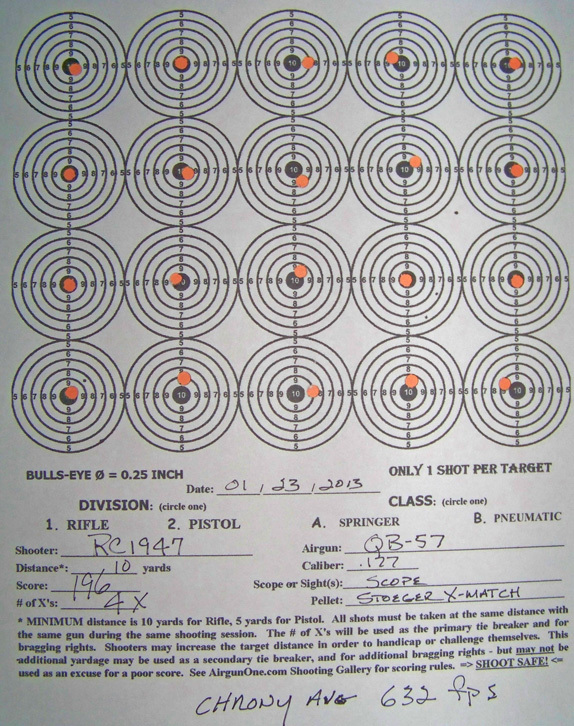 Also, the 13/22 SuperSear reduced the shot-to-shot variation in trigger pull weight by over 10%, making trigger pull more predictable and again aiding in practical shooting accuracy. If you want to make one simple, easy and predictable improvement to the trigger of your new Crosman 1377 or 2240 air pistol, the Archer Airguns 13/22 SuperSear could be your best choice!